This “Geologic Play Book for Utica Shale Appalachian Basin Exploration” (hereafter referred to as the “Utica Shale Play Book Study” or simply “Study”) represents the results of a two-year research effort by workers in five different states with the financial support of fifteen oil and gas industry partners. The Study was made possible through a coordinated effort between the Appalachian Basin Oil & Natural Gas Research Consortium (AONGRC) and the West Virginia University Shale Research, Education, Policy and Economic Development Center. The Study was funded by industry members of the Utica Shale Appalachian Basin Exploration Consortium (the Consortium). The 15 industry members of the Consortium were joined by individuals from four state geological surveys, two universities, one consulting company, the U.S. Geological Survey (USGS) and the Department of Energy’s (DOE) National Energy Technology Laboratory (NETL), who collectively comprised the Research Team members of the Consortium. This play book incorporates and integrates results of research conducted at various granularities, ranging from basin-scale stratigraphy and architecture to the creation of nano-porosity as gas was generated from organic matter in the reservoir. Between these two end members, the research team has mapped the thickness and distribution of the Utica and Point Pleasant formations using well logs; determined favorable reservoir facies through an examination of outcrops, cores and samples at the macroscopic and microscopic scales; identified the source of the total organic carbon (TOC) component in the shales and estimated the maturation level of the TOC; and searched for reservoir porosity utilizing scanning electron microscopy (SEM) technology. This Study builds on and continues what was learned when AONGRC compiled the Trenton-Black River Play Book. That study examined the stratigraphic interval from the base of the Black River up through the Trenton Limestone and the stratigraphically-equivalent Lexington Limestone. However, it also included an examination of the upper Trenton time-equivalent Point Pleasant Formation that was deposited in a shallow depocenter located between the Trenton Platform to the north, extending from what is now Indiana to New York, and the Lexington Platform to the south, in what is now Kentucky, southwestern West Virginia and western Virginia. Near the end of Trenton time, while relatively clean carbonates were being deposited on the platforms, a mixture of clastic muds and carbonates was being deposited in the intra-platform basin, creating the Logana Shale Member of the Lexington/Trenton Formation, and the younger Point Pleasant Formation above the Lexington/Trenton, which was succeeded by deposition of the darker, but not necessarily more organic-rich Utica Shale. The Utica Shale Play Book Study had three main objectives: (1) characterize and assess the lithology, source rock geochemistry, stratigraphy, depositional environment(s) and reservoir characteristics of Utica and equivalent rocks in the northern Appalachian basin; (2) define Utica oil and gas fairways by integrating regional mapping work with drilling activity and production tracking efforts; and (3) provide production-based and volumetric Utica resource assessments informed by geologic and geochemical data collected during the course of this Study. The goals of the Study were accomplished through development of a multi-disciplinary research plan with nine separate tasks, each of which was assigned a team lead in order to streamline project management efforts. To the extent possible, sampling, data collection and related efforts for each task were conducted by the researchers in each state, and then shared with the team leads for compilation and further interpretation. In those instances where a task was particularly broad and/or data intensive, the team lead received support from one or more additional research team members. Although this play is referred to as the Utica Shale Play, the play is neither “Utica” nor “shale.” Drilling tracking activities, bulk mineralogy and carbonate analyses, TOC data, thermal maturity evaluations and stratigraphic correlations all point to an interbedded limestone and organic-rich shale interval in the underlying Point Pleasant Formation as the preferred drilling target. Currently, drilling activity to the Point Pleasant is concentrated in roughly a north-south trend in eastern Ohio, although recent drilling in the north has shifted toward the northeast and eventually nearly west-east in northern Pennsylvania. This pattern of drilling approximates the subsurface strike of the formations while maintaining a fairly consistent depth of drilling – and maturation – pattern. Changes in maturation level as these formations become deeper to the east have resulted in roughly parallel trends of oil, wet gas and dry gas production. The combination of a relatively shallow reservoir and the potential for liquids production has made this an attractive play. The optimum conditions for liquids production appear to be a combination of depth, reservoir pressure and gas-to-oil ratio that is high enough to drive oil to the wellbore. As operators move eastward in Ohio (or in the current drilling trend in Pennsylvania) into areas of deeper drilling and higher maturation, dry gas is encountered. Core studies of Ohio samples have determined that the organic-rich Utica Shale has TOC up to 3.5% and an average carbonate content of 25%. This means the clay content is probably in the 70% range, which is very high (perhaps too high for the rock to be hydraulically fractured effectively). The Point Pleasant has TOC up to 4 or 5% and an average carbonate content of approximately 50% within the organic-rich facies and an even higher percentage in the limestone beds. The upper Lexington/Trenton and Logana members have carbonate content values that approximately 70% in their organic-rich facies, with TOC as high as 4 or 5%. The abundance of fossils present in these rocks indicates an environment that was well oxygenated much of the time. There are delicate trilobites and articulated ostracods that could not have been transported any significant distance. There also are beds composed almost entirely of strophomenid brachiopods, and this sort of monospecific accumulations of fossils is not likely to have been redistributed from some distant area. If they were transported from a different environment they would be more mixed with other fossils. Thus, these fossils likely lived and died in these locations. The silt-sized skeletal debris probably has been reworked; it is of an unknown origin. The depositional environment of the Point Pleasant Formation, upper Lexington/Trenton Formation and Logana Member is a relatively shallow, probably <100 ft (<30 m) deep, storm-dominated, carbonate shelf that experienced frequent algal blooms. Cross-sections show that there was not much difference in water depth between the organic-rich and organic-poor areas of deposition. The fossils present in the limestone suggest water that was at times shallow, exposed to sunlight and well oxygenated. The storm-bedding throughout suggests something well above storm wave base. The environment may have been subject to seasonal anoxia due to the frequent algal blooms. A similar depositional model may be invoked for rocks deposited in New York and Pennsylvania, although these were not studied in the same detail. 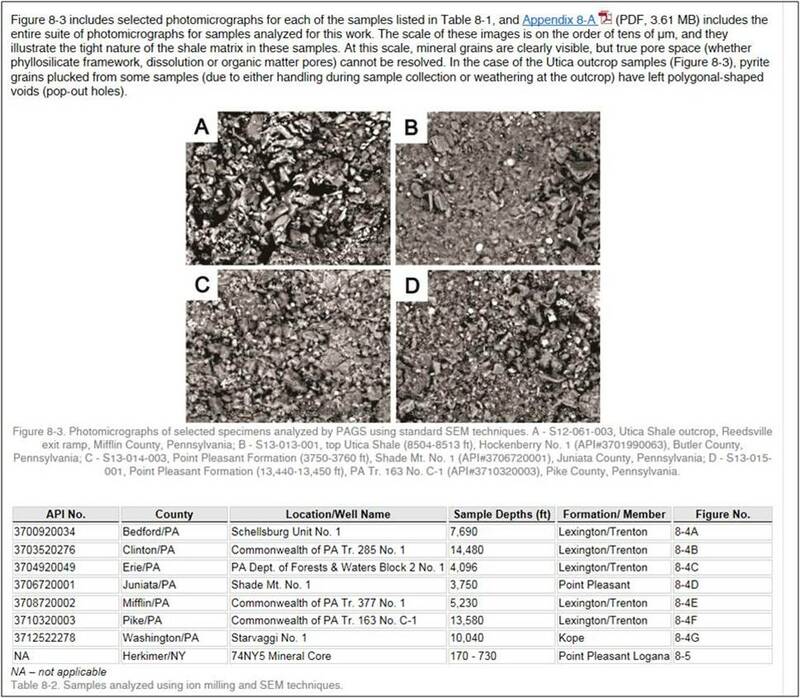 Petrographic and SEM analyses performed on Utica/Point Pleasant rocks in Ohio, New York and Pennsylvania indicate the existence of little to no matrix porosity. Porosity, where it does exist, is found in the organic matter of these reservoir rocks. If this holds true in the current producing area, the only pores that are likely to be contributing much to hydrocarbon flow are the organic pores that formed during maturation. This makes the Utica very different from other liquids-producing plays, such as the Eagle Ford and the Bakken, which have significant matrix porosity components. The resource assessment task for this Study was divided into two portions: a probabilistic (USGS-style) assessment to determine technically recoverable unconventional resources, and a volumetric approach to provide a preliminary determination of original in-place hydrocarbon resources in the Utica Shale and Point Pleasant Formation, and Logana Member of the Trenton Limestone. Both approaches evaluate roughly the same play area, which was divided into oil and gas assessment units, based on a combination of geological factors and the geographic pattern of predominately oil-producing wells and gas-producing wells in southeastern Ohio, where the greatest concentration of exploration and development has taken place to date. The probabilistic (USGS-style) resource assessment produced the following results. Please note the study’s largest source of production data was the public database from the state of Ohio. In Ohio’s way of recordkeeping, production data report NGLs and gas as a single number. Therefore, calculation of gas resource in the oil and the wet gas assessment units includes a significant percentage of natural gas liquids. For this reason, we did not include NGLs in the liquids-to-gas ratio for the gas assessment unit or a NGLs-to-gas ratio for the oil assessment unit. The oil assessment unit was determined to contain technically recoverable volumes of 791 (5%) to 3788 (95%) million barrels of oil (MMbo), with a mean of 1960 MMbo, and 2370 to 17.960 trillion cubic feet (Tcf) gas, with a mean of 8.165 Tcf. The corresponding volumes for the wet gas assessment unit ranged from 24.484 to 106.852 Tcf (mean of 56.427 Tcf). The gas assessment unit contains 228.478 to 1549.586 Tcf gas with projected mean of 717.579 Tcf gas. Together, the entire Utica Shale play contains mean, technically recoverable resources of 1960 MMbo and 782.2 Tcf gas. Original in-place resources were determined using a volumetric approach. In-place oil and gas resources were determined separately for the Utica Shale, Point Pleasant Formation, and Logana Member of the Trenton Limestone. Original oil-in-place was found to range from 6345 MMbo for the Logana Member to 43,508 MMbo for the Utica Shale with an overall total of 82,903 MMbo for the three units that were evaluated. Original gas-in-place was found to range from 348.5 Tcf for the Logana Member to 1745.8 Tcf for the Point Pleasant Formation with an overall total of 3192.4 Tcf for the three units. 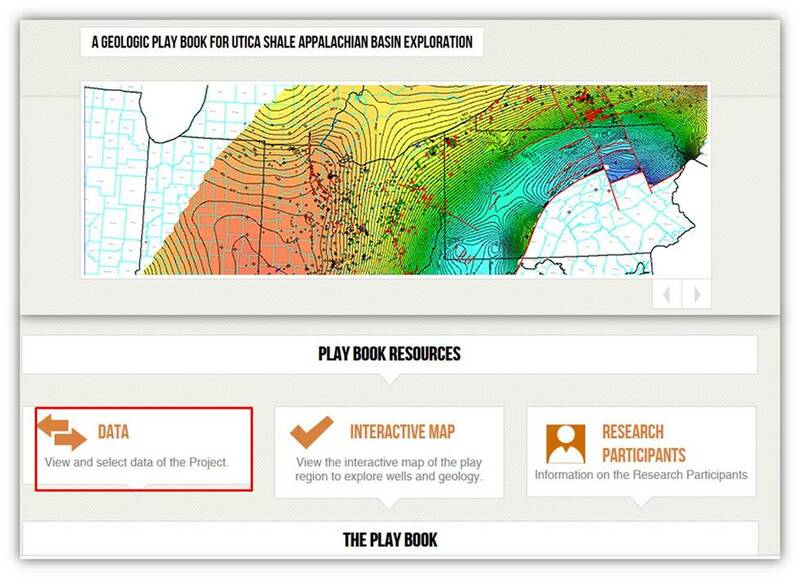 The Utica Shale Play Book Study was designed to: (1) characterize and assess the lithology, source rock geochemistry, stratigraphy, depositional environment(s) and reservoir characteristics of Utica and equivalent rocks in the northern Appalachian basin; (2) define Utica oil and gas fairways by integrating regional mapping work with drilling activity and production tracking efforts; and (3) provide probabilistic and volumetric Utica resource assessments informed by geologic and geochemical data collected during the course of this Study. The Utica Shale Play Book Study research team included AONGRC personnel from the Kentucky Geological Survey (KGS; John Hickman and Cortland Eble); the Ohio Division of Geological Survey (ODGS; Ronald Riley, Matthew Erenpreiss and Mohammad Fakhari); the Pennsylvania Geological Survey (PAGS; Kristin Carter, John Harper and Brian Dunst); the West Virginia Geological and Economic Survey (WVGES; Jessica Moore, Michael Hohn, Susan Pool and John Saucer); Smith Stratigraphic LLC (Langhorne “Taury” Smith and Michele Cooney); Washington University in St. Louis (Garrecht Metzger and David Fike); and the U.S. Department of Energy (DOE) National Energy Technology Laboratory (NETL) (Daniel Soeder and Thomas Mroz). John Barnes of PAGS analyzed hundreds of bulk mineralogy samples for the Study, and James Leone of the New York State Museum (NYSM) performed hundreds of Total Organic Carbon analyses (in collaboration with Smith Stratigraphic LLC). John Repetski of the U.S Geological Survey (USGS) contributed important analyses regarding thermal maturity trends in Upper Ordovician rocks based on conodont alteration indices, and Juergen Schieber of Indiana University performed scanning electron microscopy imaging for selected samples (in collaboration with Smith Stratigraphic LLC). Project management was provided by Douglas Patchen of AONGRC. The scope of work for the Utica Shale Play Book Study was divided into nine separate tasks, each of which was assigned a team lead in order to streamline project management efforts. To the extent possible, sampling, data collection and related efforts for each task were conducted by the researchers in each state, and then shared with the team leads for compilation and further interpretation. In those instances where a task was particularly broad and/or data-intensive, the team lead received support from one or more additional research team members. These nine tasks are shown in Table 1-1. Table 1-1. Research efforts by task. While previous Study progress reports were organized relative to these task headings, this final report has been structured differently to provide for more logical development of our research findings. Specifically, the remainder of this introductory chapter provides the details regarding access, organization and management of all data deliverables for the Utica Shale Play Book Study. Chapter 2 provides the results of Utica drilling activity and production tracking efforts. Chapter 3 describes the lithostratigraphy for Utica and equivalent rocks throughout the Study area. Chapter 4 presents the research team’s log analysis, correlation and mapping results. Chapter 5 presents the results of the research team’s core studies, including interpretations of depositional environments. Chapter 7 presents Utica source rock geochemistry findings and interpretations. Reservoir pore imaging and porosity/permeability data are provided in Chapter 8. Chapter 10 offers the research team’s overarching conclusions and implications for development of the Utica play in the northern Appalachian basin, based on data derived from this Study. The report appendices are included via links through the report and in the Downloads Section of this website. 1 Data obtained from Utica Shale Project FTP server. 2 Data obtained from Utica Shale Project Petra® file. 3 Data obtained from Trenton-Black River Project. Figure 1-1. Screen-shot display of the Study’s secure interactive map application, which was developed using ArcGIS Server. All wells with files or documents are shown along with wells having TOC data, core photos and thin section data. Selecting a well or area on the map will result in a “Layer Info” window that allows users to see the different data types available for the selection (Figure 1-2). Each data type contains a secure link or links to the project database where the data may be retrieved. Links to the well file document search system and any relevant files or documents are available for “Wells With Supplemental Data” layers (Figure 1-2). Also, links to cross-section images are available for “Cross-Section Line” layers. The application provides the ability to switch base maps as well as basic navigation and print tools. Figure 1-2. Screen-shot display showing the Study’s interactive map application. (a) Popup window with additional information, which is accessed by clicking on a well or other feature in the interactive map. (b) Well file document search system window and a core photo. Search system and files or documents (e.g., core photos) are accessed from the map application using links in the popup window. Note: Some website design and arrangement may have changed since the writing of this report. 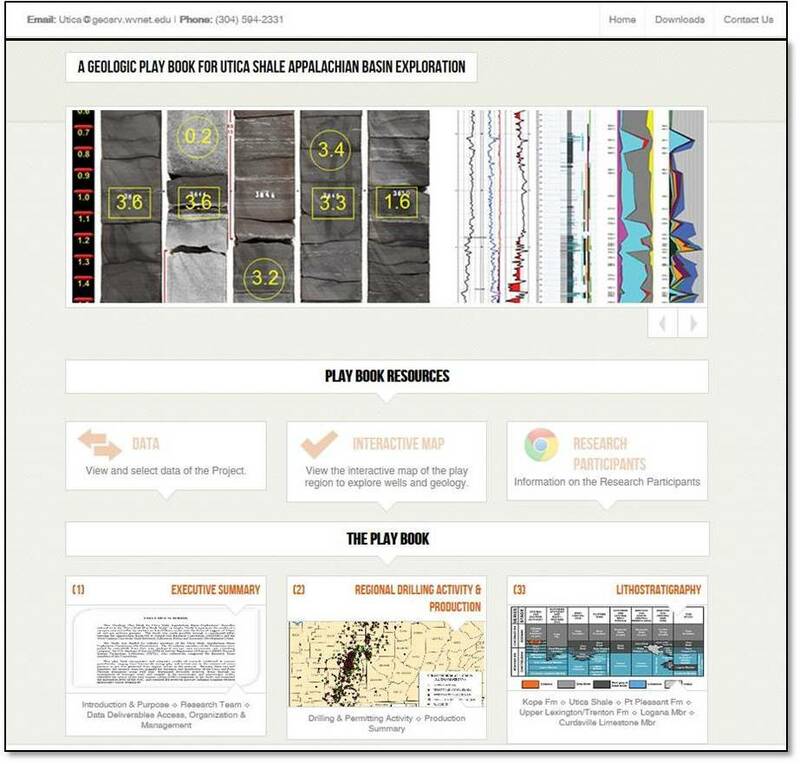 The Utica Shale Play Book Study website is the main source of data collected and generated for the project. This website runs on a Microsoft Windows server using IIS 7.0 and SSL encryption. Figure 1-3. Utica project website homepage. The website contains project information and data under three main categories: “Data”, “Interactive Map” (See section 1.3.1 for details) and “The Play Book” (Figure 1-3). Each chapter of the final project report is accessed via its own section of “The Play Book”. Links to the corresponding appendices are embedded within the text, enabling users to access related data as they read through the body of the chapter. Figure 1-4. Within each chapter of the Utica Play Book, links to corresponding appendices are embedded within the text, allowing users to access the referenced data as they read through the chapter. Figure 1-5. 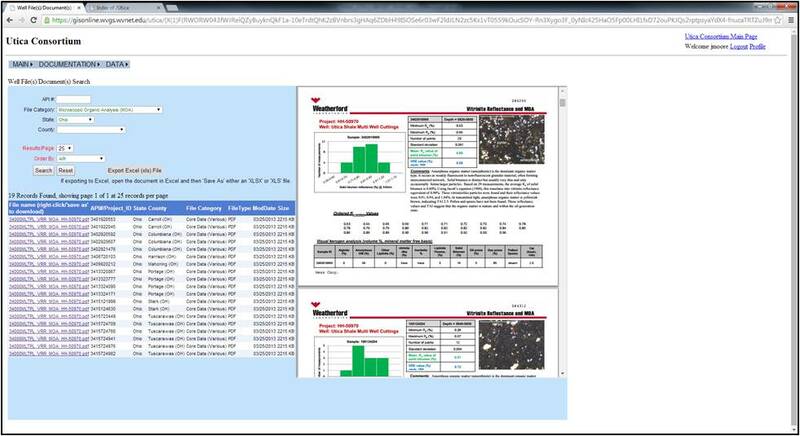 Screen-shot display of the Utica project home page with “Data” tab highlighted (http://www.wvgs.wvnet.edu/Utica). Results of the data search may also be exported to Excel, where the data are able to be further sorted (Figure 1-6). Hyperlinks to the individual files are embedded in the Excel file, which allows users to link back to the project webpage to retrieve the data without performing a duplicate search. Figure 1-6. Example of a customized Utica database search (Microscopic Organic Analysis, Ohio) with results. The results may also be exported to an Excel file, which allows further sorting of the data. The Excel file also contains links back to each file, which eliminates the need for duplicate searches across multiple work sessions. The Consortium database utilizes Oracle 11g technology. The database was initially populated with metadata of the documents uploaded by research team members in fulfillment of the requirements of Task 1 (Organization of Existing Data) and has been periodically updated as new data have become available. This searchable database is now available via the project website (http://www.wvgs.wvnet.edu/utica (ed. : This website). All data are organized by API number, as available. If an API number was not available, a Project ID was generated for the well or document. The folder structure within the Consortium database was initially organized so that each well document file would be classified within a single file category (e.g., Digital Logs, Sample Descriptions, etc.). This file category would serve as the root of the directory folder, with subfolders for each state within the root category. As organization of the data progressed, it became apparent that a given document may contain several data types and would need to be cross-listed within the database. Table 1-2 lists the file categories, abbreviations, and document counts for the database (current as of July 9, 2014). Table 1-2. Consortium file categories, abbreviations and number of files per state. Data categories and counts are current as of July 9, 2014. Individual wells contained in the file are stored in a second table, which is linked by the file name, allowing the user to search by any of the individual API numbers/Project IDs contained within the multiple well file. As the data collected, generated, and interpreted by the research team became finalized, new file categories were created and populated with project results. In addition, a general file with all header data was created, allowing users to import project wells into various subsurface mapping programs. For convenience when downloading multiple image files (e.g., thin-section images, core photographs or SEM images), additional zipped folders that contain all the images have been created. The resultant files are very large, but allow users to retrieve all images without having to download large numbers of individual image files.